Reeves really doesn't like anybody very much. Assuredly, he wouldn't want his daughter to marry one of them: "The people are right. Politicians are a bunch of no-good, lying hypocrites." It's easy to see this breezy, sarcastic book as a flip exercise in negativism. But Reeves does throw out at least one interesting suggestion: the big "issue" shaping up in the '76 election is-Washington. Whoever can most convincingly dissociate himself from what Jimmy Carter calls the "Washington mess" will have a jump on the rest of the pack. Even Gerald Ford, whom Reeves effectively cut up in his first book (A Ford, Not A Lincoln, 1975), warns of the bureaucratic menace in the Capital during his stomps on the hustings. So. . . where do we stand? With Jackson, "religiously anti-Russian," friend of Boeing, Israel, and the SST? 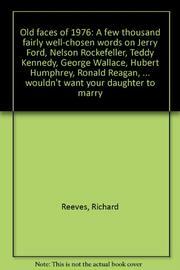 With Reagan, "a hell of a salesman, for 20 Mule Team Borax, General Electric, conservatism or himself?" Waiting for Godot, a.k.a. Teddy Kennedy? With Hubert Humphrey, the eternal candidate, campaigning since 1960? Reeves' book has been slapped together chiefly from magazine pieces, some going back to scan the '72 election, and he's candid about the fact that what with so many horses in the race, a reporter is "pretty much reduced to dealing in essential anecdotes." Not much depth here, but lots of anecdotes.